It was the Methodist preacher Phillips Brooks who gave the world the Christmas hymn “O Little Town of Bethlehem.” He was visiting the Holy Land, on road from Jerusalem to Bethlehem on Christmas Eve, when inspiration struck. Bethlehem was where King David was born and where his descendant Jesus Christ would be born. Because of Micah’s prediction made 700 years before Jesus’ birth, four details were anticipated. Did you know that you have a one in 136,011 chance of death by lightning strike? Your odds of winning the Powerball lottery are only one in 292 million. In this series, Skip Heitzig investigates a number of biblical prophecies that would be impossible for Jesus to fulfill unless He was God Himself. 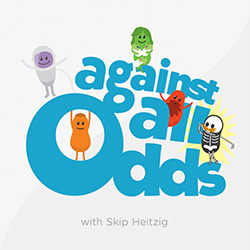 So whether you're a skeptic or you want to strengthen your faith, join us for Against All Odds. Teaching: "Oh Little Town of Bethlehem"
The original wise men were probably Zoroastrians, monotheists from the East (likely northeastern Iran). The Magi were most likely sent as a religious-political convoy to Bethlehem to inquire about the star, knowing the ancient texts found in Micah 5:2 and the prophecies of Daniel. In ancient Israel, there were two Bethlehems: one in Judah (south) and one northwest of Nazareth (north). What are the odds of Jesus being born in Bethlehem? To find the prophetic specificity of the place: the average population of the earth from the time of Micah to the present divided by the average population of Bethlehem during the same period = 2,000,000,000/7,150, or one chance in 2.8×105. Micah gave the prophecy 700 years before Jesus was born. Some doubt Micah 5:2 is an actual prophecy. Yet there was adequate time between the recording of the prophecies in the Old Testament and the recorded New Testament fulfillment (400 years). The New Testament accounts of Jesus were also accepted as fulfilled prophecy by Jews close to those events. Probe: Nothing happens that is not anticipated by a sovereign God. Discuss the interrelationship between God's foreknowledge (knowing something in advance) and His active participation (through miracles, fulfilled prophecy, etc.). The Jews had been expecting the Messiah for centuries. Some thought he'd be political—a conquering king. Others thought he'd be a prophet or a priest. All three offices—prophet, priest, and king— are found In Jesus. Anointed is the Greek translation of meshiach, the Messiah. The root of the word means to smear. In ancient times, kings were anointed with oil. It carries the idea of being a chosen one. There is one coming deliverer, who has been anointed above others (see Psalm 45:7). In Luke 4:18, Jesus referenced His anointing with a recitation of Isaiah 61. Woven throughout all the Old Testament prophecies are precise predictions concerning the Messiah. They are also found in various Jewish texts (the Talmud, Mishnah, etc.). Many didn't see the full nature of the Messiah, but through prophetic foreshortening (a single prophecy linking events that happen at separate times), the Messiah was being revealed in and through Jesus. Probe: Discuss how Jesus holds the munus triplex: prophet (see Luke 13:33), priest (see Hebrews 6:20), and king (see Revelation 1:5). How did Jesus fulfill all the offices, expanding our understanding of the Messiah's rule and reign? The Magi asked a loaded question when they inquired about the "King of the Jews" (Matthew 2:2). This was taken as a direct challenge to Caesar Augustus' rule and authority. Ancient writers such as Virgil depicted Augustus as a savior and king. The Roman Senate nominated Augustus and called him "King of the World." Likewise, Herod was called "King of the Jews." The Magi's phrase troubled (agitated, perturbed) Herod. He felt threatened. Herod was paranoid; he married ten wives and killed his first and second sons because they threatened his reign. Unlike Caesar, Christ will rule as righteous and shepherd His people. His first coming was as Savior; His second will be sovereign judge. Probe: Discuss the differences between Jesus' two comings. See Luke 2 (His birth) and Revelation 19-20 (Jesus' coming at the end of the tribulation). The scribes didn't quote the entire verse in Micah 2. They left out some of the text, particularly the word everlasting, a reference to the Messiah's eternal nature. Even in strictly Rabbinic documents, the premundane [existing before creation], if not the eternal existence of the Messiah appears as matter of common belief. Such is the view expressed in the Targum on Isaiah 9:6 and in that on Micah 5:2. But, the Midrash on Proverbs 8:9 expressly mentions the Messiah among the seven things created before the world…. The name of the Messiah is said to have been created before the world. Jesus was the fulfillment of this. He was the only person who lived before He was born (see John 1:1; John 1:15; Revelation 1:8; Colossians 1:17). Probe: As the second person of the Trinity, Jesus is both divine and human. Why is it important to keep the two in balance when discussing Christ's nature and work in the world? Connect Up: Jesus said when you see Him, you see the Father (see John 14:9). Jesus is both man and God, and though we can't completely comprehend this truth, we can apprehend what the Bible declares. How do Christ's two natures give us insight into the nature and love of God? Connect In: The body of Christ is the hands and feet of Jesus in the world. Discuss ways we can proclaim both Christ's humanity (in service to others) and His divinity (His salvation, love, second coming, etc.). Connect Out: How can you use Christ's specific prophetic fulfillments to share with Jews? Share two points you found fitting. Caesar and the Roman Senate gave Herod the title "King of the Jews"
Works referenced: The Life and Times of Jesus the Messiah, "O Little Town of Bethlehem," "We Three Kings of Orient Are"
Hello, and welcome to this teaching from Skip Heitzig of Calvary Albuquerque. We pray that God uses this message to strengthen your faith. If he does, we'd love to hear about it. Email us at mystory@calvaryabq.org. And if you'd like to support this ministry financially, you can give online securely at calvaryabq.org/giving. The town of Bethlehem was where King David was born, and where his descendant, Jesus Christ, would also be born. As we continue the series "Against All Odds," we learn four details about Christ's birth that were predicted 700 years before it happened. Now, we invite you to open your bibles as Skip begins the message, "O Little Town of Bethlehem." Would you please turn in your Bibles to the Gospel of Matthew. That's your New Testament, as you know, first book in the New Testament, Matthew chapter 2. But then also, if you don't mind, turn also to the book of Micah in the Old Testament. That is the seventh book from the end of the Old Testament. If you have a Bible just like mine, it's 50 pages back. I know that won't help you, but find the book of Micah chapter 5, verse 2, and then also Matthew chapter 2. Probably the most famous village in the whole world is a little town in the Middle East called Bethlehem. Most everyone that I've ever known who's wanted to go take a tour to Israel wants to go to Bethlehem, for obvious reasons. However, most people when they go there are a bit disappointed with Bethlehem. It's not what they anticipated. It's not the little town of Bethlehem that is in the songs. And one of my vivid memories of going to Bethlehem was on Christmas Eve many years ago. We took a church group, we decided to have Christmas in Israel. And so for Christmas Eve, we went to Bethlehem in Manger Square where people from all over the world come. But I was disappointed. I was disappointed because you have to go through airport security monitors to get into Manger Square. There's metal detectors, there's armed guards with M16s, there's tanks, armored vehicles. And to sing "O Little Town of Bethlehem" with warm fuzzies in your heart when that's going on around you, it was tough to do. The town of Bethlehem where Jesus was born-- the whole world has heard of Bethlehem for one reason, and that is that Jesus was born there. Now, I know, some of you are thinking the sermon title is "O Little Town of Bethlehem," you're like a few weeks too late on this, Skip. Christmas is done. We put away our nativity set. And so I want you to sort of unpack that in your mind and get Bethlehem back on the table, because we're going to look at, in this series "Against All Odds," the fact that it was predicted that the Messiah would be born in Bethlehem. So let's begin with Micah chapter 5. One verse in that book in that chapter, verse 2, where the prophet says, "But you, Bethlehem Ephrathah, though you are little among the thousands of Judah, yet out of you shall come forth to me the one to be ruler in Israel; whose goings forth are from of old, from everlasting." And then Matthew chapter 2, the familiar story in verse 1, "Now after Jesus was born in Bethlehem of Judea in the days of Herod the king, behold, wise men from the east came to Jerusalem, saying, Where is he who has been born King of the Jews? For we have seen his star in the east, and have come to worship him. When Herod the king heard this, he was troubled, and all Jerusalem with him. And when he had gathered all the chief priests and the scribes of the people together, he inquired of them where the Christ was to be born. So they said to him In Bethlehem of Judea, for thus it is written by the prophet." Now they quote Micah chapter 5, verse 2. "But you, Bethlehem, in the land of Judah, are not the least among the rulers of Judah, for out of you shall come a ruler, who will shepherd my people Israel. Then Herod, when he heard, had secretly called the wise men, determined from them what time the star appeared. And he sent them to Bethlehem, and said, go and search carefully for the young child; and when you have found him, bring back word to me that I may come and worship him also. And when they heard the king, they departed; and behold, the star, which they had seen in the east, went before them, till it came and stood over where the young child was." Now, as we look at these predictions, especially this one in Micah and how it's reiterated in Matthew, there are two basic things to discover. Number one, nothing happens that is not anticipated by a sovereign God. Nothing happens that is not anticipated by a sovereign God. God is just flat in control of history. And number two, not only does God anticipate events, but he arranges them often against the odds to show his power and to show that he has a plan. So just those two truths should be enough to bring joy and rest to your hearts. Now, we are told in Matthew that wise men came from the east. The word wise men, or the words wise men, come from the translation of Greek magos or magi, magi. Now, I don't think any group in the Christmas story has suffered more than the Magi. And that's because of a song that was written in 1857, became very popular, and it's sung every Christmas season, "We three kings of Orient are, bearing gifts we traverse afar." And so we have seen in our mind's eye three kings coming from the east with their gifts. But first of all, they were not kings, they were magi. They were spiritual advisers. They were kingmakers, not kings. Second, there were not three of them. We think there's three because they bring three gifts, gold, frankincense, and myrrh. Or as one child thought it read, gold Frankensteins and smurfs. But it doesn't say there were three of them. In fact, they usually traveled in large groups. It was probably an entourage of people from the east with these three gifts, that is why King Herod was troubled. Also, they didn't come from the Orient as we know it, they came from Parthia, or ancient Iran, northeastern Iran. So if you were to concoct a Christmas song that would be more accurate, I suppose it would be, "we huge entourage of Parthian astronomers from Iran are, bearing gifts we traverse afar." But that would never pass the songwriting committee, now would it? So we have that song. Originally, the Magi were Zoroastrians. Have you ever heard of that term? It's a religion that worships a single God. It's an ancient religion but it is still practiced in some places today. And the single God is Ahura Mazda, that is what they call that God. It might be interesting for you to know that the words magic or magician come from the term magi, because of that background, because of that religious background, the mystery religious background. But also the word magistrate comes from the word magi. And that is because this religious group had an enormous clout in the political field. They worked for the courts of ancient kings. In fact, in Nebuchadnezzar's court in the book of Daniel, the magi were very, very prominent. They were the highest ranking officials in Babylon. And you may recall that Daniel becomes the chief of the magi. He interprets a dream for Nebuchadnezzar the king, which saves the life of all the wise men of Babylon, the magi of Babylon. And because of that, Daniel is promoted to be the head, or the chief of the wise men of Babylon. And that's probably why they are here in this story. Why else would people travel hundreds of miles from the east to come to Judea to Bethlehem to find the King of the Jews? What would they care about a Jewish King? Unless a Jewish prophet had primed the pump and tipped them off with his prophecies that a Jewish King would be born. And that's why I believe they're there. I think it's directly to the influence of Daniel. But the key element in the story is not the wise men. The key element is the prophecy that the Jewish leaders tell to Herod. Now, in this prophecy-- we're going to unpack it, the one in Micah and the one that is given a free rendering in Matthew 2 by the religious leaders --there are four details that were anticipated at the birth of Jesus Christ by this prophecy. And first is the place the Messiah would be born, the place of Messiah. In verse 4, when Herod gathered all the chief priests and scribes, he inquired of them where the Christ was to be born. And so they said to him, "In Bethlehem of Judea for thus it is written by the prophet." Now, at this point, they are quoting from Micah chapter 5, which we read, "But you, Bethlehem, in the land of Judah." Notice how specific the prophecy is. This is Bethlehem in the land of Judah. Now, if you're an astute observer, you're thinking at this moment, wait a minute, it says Bethlehem in the land of Judah in Matthew, but back in Micah it says, "But you, Bethlehem--" What's the word? Is it in front of you? Micah 5:2, "But you, Bethlehem Ephrathah." It's a hard word to say, isn't it? "But you, Bethlehem Ephrathah." So what does that mean? Why is it rendered one way in one place, one way in another place? Ephrathah was the old ancient term for Bethlehem. There was a town next to Bethlehem called Efrat. It's still there today, you can see it and visit it. So in old days it was called Ephrath or Ephrathah or Bethlehem of Ephrathah, but it's in the land of Judah. So when the scribes answer, they're just saying Bethlehem in the land of Judah. Why so specific? Well here's what's interesting, there wasn't one Bethlehem. There were two Bethlehems in Israel. One was Bethlehem in the north, six miles from Nazareth. And the second was Bethlehem in the South, or Bethlehem of Judea. So this specific prophecy is important. He's not going to be born in that Bethlehem but the one way, way down south. Whenever you want to discover the identity of the Messiah, you have to begin with his birth, where he was born. Several years ago somebody came on a midweek Bible study-- a Thursday night Bible study to our church saying that he was Jesus Christ. Well, I didn't know this till an assistant pastor who met this man first ran up to me, big eyes, going this guy just came in who says he's Jesus. I said I'd like to meet him. I've always wanted to meet Jesus. So I walked up to him, put my hand out and said, I'm Skip. He goes, I'm Jesus Christ. So I said well, I have one question for you, where were you born? He said Philadelphia. I said, there's the door, get out. Because the Messiah was predicted that he would be born, not in Philadelphia, but in Bethlehem of Judea. That's what the prophet said. Now, you might ask, well, what is the probability of someone being born in Bethlehem in the last 2000 years? To answer that question, you need to take the average population of the town of Bethlehem from the time of Micah the prophet who uttered the prophecy, up till modern days and divide that by the population of the earth from the time of Micah up till modern days. You kind of take those averages and you'll get the odds. So that would be 7,150 divided by 2 billion to round it off, or 2.8 times 10 to the fifth power. Roughly, conservatively, you have about 1 chance in 100,000 that anyone's going to be born in Bethlehem. So when you make a prediction like that, you have 1 in 100,000 chance. However, when you add other details to the prophecy, you narrow the margin that it could be fulfilled. For example, what are the chances that somebody being born in Bethlehem would be of the lineage of King David? Now you have fewer people. And what are the chances that somebody born in Bethlehem from the lineage of King David ride into Jerusalem on a donkey later as the prophets predicted? And then what are the odds of a person being born in Bethlehem from the lineage of King David who rides into Jerusalem on a donkey be also betrayed for 30 pieces of silver? And you just keep layering those predictions on and you narrow the margin exponentially that it could ever be fulfilled. Now, this is a prophecy by Micah in the Old Testament. Micah chapter 5 verse 2. Micah was, get this, a 7th century BC prophet, which means he predicted the place, Bethlehem, 700 years before Jesus was born. Well, fast-forward 700 years to Joseph and Mary and they've got a big problem. The big problem is they don't live anywhere near Bethlehem. They live way up in Nazareth, 70 miles from Bethlehem of Judea as the crow flies. 92 miles the ancient route would take you. So you got a problem. How is God going to get a couple living in Nazareth down to Bethlehem of Judea? It's a lot easier if they went to Bethlehem in the north, it's only six miles away. But it's specific, it's Bethlehem of Judea. Well, fortunately, we have a God who loves to play chess. And everybody on the chess board is not a king, queen, or a rook. They're all pawns to him, and he moves them around. Even if they call themselves a king, on God's chessboard they're pawns. Proverbs 21:1 "The king's heart is in the hand of the Lord, and he moves it wherever he wishes." And so God is calling the shots. And what does God do? It's as if he steps into the throne room of Caesar Augustus in Rome and puts something in his head that was very unusual. You know what that is because you know the Christmas story. Luke chapter 2 says, "In those days, Caesar Augustus issued a decree that a census should be taken of the entire Roman world. This was the first census that took place while Cyrenius was the governor of Syria. And every one went to his own town to register." So we have a law given by Caesar in Rome that every one has to register. No exceptions. So now we have the problem solved. How else are you going to get a pregnant woman in her third trimester to walk 100 miles? Or to ride a donkey 100 miles? Nobody's going to do that. But there were no exemptions, so she and Joseph went from the north down south. Here's the grand truth behind that. Caesar may be ruling but God is overruling. OK. Caesar's not in charge. God is large and in charge, and he's just moving the pawns on the chessboard as he wishes. Now, the key issue is were these actual prophecies? In other words, were they written before the time of Jesus? I bring that up because there are folks who will say, well, Jesus fulfilled supposed prophecies, but those were written after the fact. Now, if you can discover they were written after the fact, now you have a fraudulent document and the Bible is not to be trusted. So two questions play into this. Number one, was there adequate time between the recording of the prophecies in the Old Testament and the recorded fulfillment of those prophecies in the New Testament? Second question, were the New Testament accounts of Jesus accepted as being fulfilled prophecy by the Jews who were closest to those events? And the answers are yes and yes. You see, there is a 400 year gap between the final prophecies of the Old Testament and the birth of Jesus Christ in the New Testament. A 400 year gap. During that 400 years, something very significant happened. The canon of the Old Testament was codified, meaning the list of what are biblical books of Old Testament Jewish scriptures were codified, were systematize, and were regarded as this is the Bible. These are the books of the Bible. So by the time Jesus was born, the books, including the books that contain all the predictions about the Messiah, were already part of Jewish scripture. Something else to add to that, we have the evidence of the Dead Sea Scrolls. You've all heard of the Dead Sea Scrolls. These are documents written 200 years before Jesus was born, and amazingly preserved in caves in Israel until 1947, that's when they were discovered. So now we're able to dig those scrolls out of the ground and look at a freeze frame picture of Judaism 200 years before Christ. And we have all of those books of the Old Testament, including the ones that had all the prophecies written about the Messiah. So that's why I say yes and yes. Something else, when we get to Matthew chapter 2, it's pretty obvious that the Jewish leaders expected the Messiah was going to be born in Bethlehem because when Herod says, hey, where's the Christ going to be born? They said, in Bethlehem of Judea, for thus says the prophet. So they had already interpreted it to mean our Messiah, when he comes is going to be born in Bethlehem. All of that to say, the Jewish expectation was that the Messiah would be born in this place, that's the place of Messiah, the town from King David, Bethlehem. Let's look at another detail, the person of Messiah. Notice the question. When Herod gathered the chief priests and scribes together in verse 4, it says, "he inquired of them where the Christ was to be born." We refer to Jesus as Jesus Christ. I hate to break it to some of you, Christ is not his last name. I've heard people think that-- actually think that. They think that H was his middle initial and Christ was his last name, and that's not the case. Christ is an English word from the Greek word christos, which is a word from the Hebrew word mashiach, which simply means messiah or the anointed one. The anointed one. What does that mean to be an anointed one? Christ, Messiah, who was that person? The original meaning of messiah, or anointed one, is to smear with oil. To anoint was to smear with oil. That is because if you had a priest, a prophet, or a king, and you would designate them as chosen for their respective offices, there was the little ritual where they would be taken, oil would be poured on them, and they'd smear it on their face. That was called the anointing. And so you had these people in the Old Testament anointed to be a prophet, anointed to be a priest, anointed to be a king. But the Old Testament kept pointing to one who would come, a deliverer who would come, a Messiah who would come, an anointed one who would come. And Psalm 45 says he will be anointed above his fellows. He is the anointed one. No wonder then when Jesus goes to the synagogue in Nazareth and opens up the scroll-- remember the story from Luke 4, opens it up --stands up there and he reads from Isaiah 41. The familiar text, "The Spirit of the Lord God is upon me, because he has anointed me to preach the gospel to the poor." He closed the scroll, he put it down, and he said to the audience, "Today this scripture is fulfilled in your hearing." The Bible says they reacted violently, took up stones to kill him, because they knew what he was claiming to be. He is claiming to be the Messiah. Sometime later, he is with his disciples and he says, "Who do men say that I am?" Second question, "Who do you say that I am?" And Peter said, "You are the Christ, the Son of the living God." You are that one. You are that anointed deliverer that the Old Testament repeatedly talked about would come. So woven throughout Hebrew scripture, you have predictions about the birth, about the lineage, about the mission of the Messiah. And since those things were written so long before, for nearly 2000 years rabbis have commented extensively on these scriptures, including Micah chapter 5, verse 2. And it was, as I said, the common Jewish belief that the Jewish Messiah would be born in Bethlehem. Not just from Matthew chapter 2, but other places. You've read them, but you probably passed over them. For example, John chapter 7, the crowd is discussing who is this Jesus? Is he really the Messiah? Could he be the Messiah? And the crowd says this-- and I'm quoting John 7 --"Will the Christ come out of Galilee? Has not the scripture said that Christ comes from the seed of David and from the town of Bethlehem where David was?" So their traditions, their interpretations along with their scripture told them our Messiah is coming from there and he will be the deliverer. Now, there's been some words I've used in the past several years, and you've heard them, you're familiar with them, but you may not know what they are. You've heard me talk about the Talmud, right? I quote the Jewish Talmud or the Mishnah or the midrash or the Gemara or the targums. And without trying to give you all the different definitions of all of them, what these essentially are are translations, paraphrases, commentaries, and interpretations of rabbis on Old Testament scripture. And why are they important at all? Because they help us understand what Jewish people thought of Old Testament texts, right? So let me give you an example. This is from the targums. This is written by Rabbi Eliezar He is paraphrasing or he is interpreting Micah chapter 5 verse 2, and look at how he writes it. "And you, O Bethlehem Ephrathah, you who were too small to be numbered among the thousands of Judah, from you shall come forth before Me the Messiah, to exercise dominion over Israel, he whose name was mentioned before, from the days of creation." So two things, Jews expected a Messiah, a deliverer. They expected he would come from the line of David. They expected he would be born in Bethlehem. Well, that raises a question-- and I get asked it all the time --well, if that's true, why didn't more Jewish people at the time of Jesus accept him as their Messiah? Why'd they crucified him? Why'd they reject him? It's a very good question. And here's the answer. It's because those prophecies also predicted that when the Messiah comes, he's going to set up a kingdom. He's going to rule over the earth. The problem was when the predictions were given, there wasn't a delineation of sequence given, there wasn't a timing given. You'll have a prophecy saying he's going to be born in Bethlehem; you have another prophecy saying he's going to rule the world; another one saying he's going to do miracles; another one saying he's going to suffer and die; another one saying he's going to rise from the dead. So it's all of these strange predictions. And we have this phenomena called prophetic foreshortening, prophetic foreshortening. What that is is from a distance, it looks like it's all one thing that's going to happen at one time. There's not the interval of time that is seen clearly. Here's what it's like. If you're traveling and you see in the distance as you're driving down the road, in the distance you see a mountain range. From your perspective far away, the mountain range looks flat, looks monolithic, like you're just seeing one straight ribbon of rock. But the closer you get, you notice some things. And the closer you still get, you notice shading and shadowing, and there's not one monolithic mountain, there's several mountain peaks. And if you get right up on it or even fly over it or drive through it, you see there's valleys in between the mountain peaks. You didn't see them from a distance, but now you do. And the closer you get to the event of Messiah, the mountain range opens up, and you see, oh, well, his first coming he's going to do this, but his second coming he's going to do that. That is why there wasn't a ready reception for many of them. So that's the place and that is the person of Messiah that is mentioned in this prophecy. The third little detail is the purpose of Messiah. Now, you will notice that the Magi in Matthew chapter 2, they come and they say, "Where is he--" look at the question verse 2 --"where is he who has been born the--" what? " --King of the Jews." They didn't say the word Christ or Messiah. "Where is he who has been born King of the Jews?" Can I just say if I were there with the Magi, I'd say wrong question, dudes. I mean, it's the right question but not to Herod. Because as soon as he used that phrase to Herod, it got Herod's attention. It's like his neck reeled around and said, who are you looking for? The King of the Jews? The King of the Jews? That was a politically charged term 2000 years ago in Judea, and here's why. First of all, who is the head of the Roman Empire? Caesar. Caesar's the ultimate king, he's the big dog. To say there's another king of any kind anywhere could be seen as a direct competition of Caesar. Virgil, the Roman poet, said that Caesar Augustus was the savior king of the world. But even more than that, since Caesar was far away in Rome, Herod, Herod the King was given a title by the Roman Senate and by Caesar Augustus himself, and guess what Herod's title was? King of the Jews. He was the king of the Jews. He was called that by the Roman Senate and Caesar Augustus. You are the king of Judea. I'm letting you rule in my place in that part of the world. You, Herod, will be the king of the Jews. So now, Herod hears these wise men coming, asking him this question. These Parthian astronomers, these kingmakers from the ancient Babylonian courts. And they're coming saying we're here to find the King of the Jews who has been born. We want to worship him. You need to know something about Herod. Herod was paranoid. History tells us he was a paranoid ruler. He married ten wives, he had several children, he killed one of his wives and two of his sons because he was so paranoid they were trying to take the throne away from him. In fact, even Caesar Augustus said it is safer to be Herod's pig than it is his son. So you have all of this working together. He panics, he doesn't want to lose control, and so he sends them back to Bethlehem. And you know the rest of the story how he kills the children of that town. Now, he is the Christ. He will be the King over the world. He will be the King of the Jews as well as the King of the Gentiles. But you will notice also, it says, as they quote the prophecy, their rendering of it, verse 6, "For out of you will come a ruler--" and I love this "--who will shepherd my people Israel." Yes, Jesus will come back. Yes, he will rule and reign because the prophecies said he will over the world as predicted by the prophets. But his rule is a gentle rule, he rules as a shepherd over his people. David was a shepherd. The town of David was a place where David kept flocks. He said, "The Lord is my shepherd, I shall not want." When Jesus comes on the scene, he says, I am the good shepherd. But he said this, the good shepherd lays down his life for the sheep, that's why he came the first time. Jesus came the first time to be a savior. Jesus will come the second time to be our sovereign king. He'll be a ruler over the world, but he's the gentle ruler. Now, I want to close on a final note. There's a fourth detail given in the prophecy, though not mentioned by the scribes when they quote it. And that is the preexistence of Messiah, that he would preexist. So notice back in verse 6, the rulers quote "But you, Bethlehem in the land of Judah are not the least among the rulers of Judah for out of you shall come a ruler who will shepherd my people Israel." Period. They didn't finish the rest of the text. They left something out of the prophecy given by Micah. And I hope you have a marker in Micah 5:2, if not, let me read it to you. "But you, Bethlehem Ephrathah, though you are little among the thousands of Judah, yet out of you shall come forth to me the one to be ruler in Israel--" now watch this "--whose goings forth are from of old--" or literally from the beginning "--from everlasting." From everlasting. Your goings forth come from everlasting. If you were to speak to a Jewish person today-- and I hope you have Jewish friends and that you keep the door of conversation and evangelism open to them and have good hearty discussion --but a Jewish person today will tell you-- if they believe in the Messiah, if they believe he's coming --they will say the Messiah is simply a man, just a human being. He's not God, he's not the Son of God like you Christians say. We get berated because we believe in the deity of Christ. But they say when the Jewish Messiah comes, we expect he'll be a mere human being with a charismatic personality, great intellect, a love for the Torah, he'll love the scriptures, but that's all. But here's what you need to know, and most of them probably don't know, that's not what Judaism always believed. Judaism originally believed that the Messiah-- and there's abundant evidence in Jewish scholarship to show that --they believe the Messiah would be an eternally existent being with the miraculous birth, mission, and destiny. I'm going to give you a quote, show it on the screen. One of the books I've had in my study for a long time, and every pastor that I know would probably have this book. It's called "The Life and Times of Jesus the Messiah" By Alfred Edersheim. Alfred Edersheim was a Jewish scholar who converted to Christ. And this is the kind of dude who researches the targums, the Talmud, the Gemara, the Mishnah, the midrash, all that stuff, and looks to find what was going on. And this is what he said, just one little paragraph, quote, "even in strictly Rabbinic documents, the premundane--" that is at or before the beginning "--if not the eternal existence of the Messiah, appears as a matter of common belief. Such is the view expressed in the Targum on Isaiah 9:6 and that on Micah 5:2. But the Midrash on Proverbs 8:9 especially mention the Messiah among the seven things created before the world. The name of Messiah is said to have been created before the world." Close quote. Now, why on earth is your pastor making you suffer through all this? Why would I do this as a weekend message? Simply to show you this, the Jews expected the Messiah would be born in Bethlehem. The Jews expected that he would preexist and that he would rule over the world. That was their belief system historically. So that when Jesus comes on the scene, that's exactly how he is presented. The opening statement of the Gospel of John, "In the beginning was the Word, and the Word was with God, and the Word was God. He was in the beginning with God. All things were made by him; and without him not anything was made that has been made." That's what John the Baptist meant when he spoke of his younger cousin Jesus. John the Baptist was the older cousin of Jesus. And when Jesus came on the scene, John the Baptist said, John 1:15, "This is the one I was talking about when I said someone is coming who is far greater than I am, for he existed long before I did." What a statement. This is what Paul meant in Colossians 1 when he said, "Jesus is before all things and in him all things consist." What this means is Jesus is the only person who lived before he was born. Get your head around that, get your mind around that statement. Jesus is the only person who existed, who lived before he was born. He preexisted. The Jews believed that he would be that one until more recent times, and that's who Jesus proclaimed to be. Now, here's the most amazing thing to me of the story. When Herod asked for an answer, hey, where's the Messiah going to be born? The scribes, the religious dudes, gave a quick answer. They knew it. They didn't have to go look it up on a computer or find a bible-- let me look it up in the back. Wait a minute, where is that? They knew it, they just could cite chapter and verse. Well, the prophet says, but you, Bethlehem in the land of Judah-- and they just spit it right out. But they didn't walk five miles to see if it was true. Now, imagine that. You know the Bible so well, you study it, you have scripture memory classes, but you don't do what it says to check it out to see if it's true. Here's these travelers from the east who have sacrificed their wealth, life, and limb to travel hundreds of miles to come from their country to show up in your country to find the King of the Jews. And you can't even get off your-- or get on your feet and go to the next town to see if it happened? You know, Bethlehem is in the outskirts of the city of Jerusalem, just a few miles away, I told you. I once took a bicycle ride from the Jaffa gate in Jerusalem to Bethlehem. I didn't know how long it would be. I was over the hill and in Bethlehem. And I remember thinking why didn't those religious leaders just take a short walk to go, hey, I'm going to find out what's happening over there in Bethlehem with all these rumors. Some people are inoculated with just enough religion to keep them immune from truth. This is what religion will do to a person. Religion makes people feel self-satisfied, I go to church, I sing hymns, I read the Bible, I do this stuff. And they feel really smug about that little routine they have. They have just enough religion to keep them immune from the truth. I can't speak for anybody else, a lot of people would think a study like this could be boring. This is what fires me up, because this satisfied my mind early on when I looked at the odds of these things happening as I told you last week. So the wise men showed up and they worshiped Jesus. You know why? Because they were wise men. They were wise. And foolish men and foolish women will only hear the rumors but not dig deep enough to find out if it's really true. Wise people will take the journey and end up in front of Christ and bow down and worship him. That's wisdom. Father, we are amazed at how profound a document the Bible is. No wonder Jesus, speaking of the Old Testament said, "and the scripture must be fulfilled," because so many predictions already had been. So Lord, we are left. We stand on earth, we look toward heaven, but in between is that Bible. That reveals who you are, what you like, what you dislike, what you want, what you don't want, who we are, what we should do. And I pray, Lord, that we would not just become self-satisfied with a little religious routine but not be motivated to go and see and to receive and to worship the Savior. Motivate us, Lord, because when we think about the odds of these things happening, we think what are the odds of me being saved? But here we are, loved by you, and grateful that we are. In Jesus name, amen. The detail and accuracy of the prophecies concerning Christ's birth are nothing short of amazing. Does learning about the fulfillment of these predictions strengthen your faith in him? Let us know. Email mystory@calvaryabq.org. And just a reminder, you can give financially to this work at calvaryabq.org/giving Thank you for listening to this message from Calvary Albuquerque. In this series, we examine together the remarkable nature of predictive biblical prophecy. The odds of one person in history fulfilling the precise prognostications of Old Testament prophecy about the Messiah are nothing short of staggering. One of the first groups to ever be wowed by it was a few of the disciples after the resurrection of Christ. Their experience went from sorrow to joy in a single afternoon. A similar examination of prophecy will do the same for us. We've seen how God repeatedly makes specific predictions about a coming Messiah throughout the books of the prophets, adding layers of details that exponentially decrease the odds of any success of their fulfillment. It's one of His unique traits (see Isaiah 41:21-24). Today we come to a prediction that is simply off the charts—the prediction that the Messiah would be virgin-born. We explore a bit of why the virgin birth is not an incidental but an absolute necessity. Very few events from Jesus’ childhood are even mentioned in Scripture. Much of His upbringing is simply not known. However, three events from Jesus’ early youth are given comment by Matthew because they fulfill prophetic Scripture. These predictions and their subsequent fulfillment tell a larger story and paint a grim picture—and that is the general response of the world to God sending His Son to save. The prophets of the Old Testament gave hundreds of predictions over 1,500 years about the coming Messiah: where He would be born, how His birth would be different, where He would move to, and where He would be raised. They also predicted events and unique features of His life and ministry. But Matthew shows that Isaiah foretold His character and His conduct. He not only came to this world against all odds; He lived among people against all expectations. We have been examining the amazing prophecies of the Old Testament and how Jesus Christ has fulfilled them. The prophets predicted His lineage, extraordinary birth, places of His residence, and character of His ministry. But why did Jesus come at the time that He did? Why not earlier? Why not later? Were there any indicators that pointed to His timely entrance into the world? Let me suggest there were five things that were just right. We have discovered that the evidence that Jesus was the long-awaited Messiah as predicted by the ancient prophets was compelling and even overwhelming. Yet not everyone believed in Jesus. And even Jesus’ own forerunner, John the Baptist, struggled with doubts. How can that be? And what evidence is helpful in reasoning through those doubts? Jesus indeed fulfilled Old Testament prophecies, but not all of them…yet! Let’s look together at how Jesus’ miracles provided solid evidence of His identity. What do you suppose the odds would be of someone showing up exactly 483 years after it was predicted he would come? Then add to that the prediction that he would come riding a donkey. Then add to that the prediction that he would not be accepted but rather rejected and subsequently killed. Sound far-fetched? It isn’t. It happened and it’s astounding. Today we continue our series Against All Odds as we consider the stand-alone event Jesus referred to as "the visitation." We have learned that Jesus’ whole life, ministry, and atoning sacrifice were foreseen and expected by the Old Testament writers. But did you know that His betrayer was also expected and anticipated? The prophets predicted him, and Jesus announced him. Judas had no idea he was fulfilling the Scriptures by being the turncoat—but he was. Let’s also ponder what Jesus knows about us and how we can be a joy and delight to His heart.